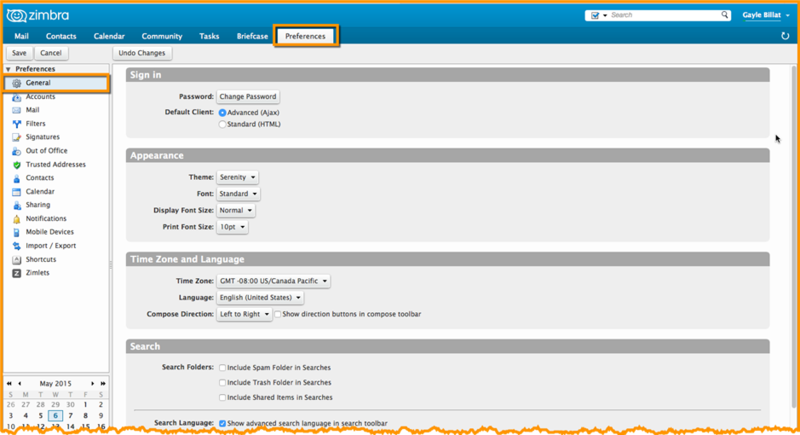 The Preferences > General page provides many ways for you to change and customize your Zimbra Web Client display. Click the General option in the overview pane. Use the Time Zone and Language options to change the default times and language displayed in your Zimbra Web Client. Use the Search options to change which folders are included in your searches. Click here to watch a video with more Zimbra Preferences information. I use Win 7 64bit…. Please help to adjust font size…..
We have 500 users on Zimbra, do you know how to change the print font size for all users? Can’t find anything in the CoS for it. You can use the Preferences > General > Display Font Size menu to save changes to your font size, as shown below. I have asked our Engineering Team which versions of Zimbra support the “Display Font Size” functionality, and I will let you know when I hear back. Watch this space for more information.